Hospitality workers across the Los Angeles area voted Dec. 6 to authorize a strike if contract negotiations with several hotel chains fail, UNITE HERE spokesman Andrew Cohen told Bloomberg Law. 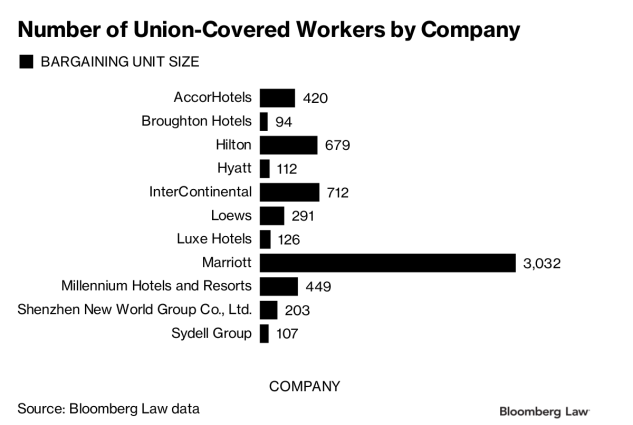 At least 20 labor contracts at hotel brands including Marriott, Hilton, and InterContinental expired Nov. 30, according to Bloomberg Law data. If workers at those hotels decide to strike, at least 6,225 people could be picketing on the streets of L.A.
An official for UNITE HERE Local 11 said employers should be able to give workers a better deal. “L.A. has one of the highest costs of living in the country, and our booming tourism industry can afford to pay its workers a living wage,” local Co-President Kurt Peterson said in a written statement. Marriott responded to a request for comment by issuing the same statement that was previously distributed. Hilton declined to comment, and InterContinental didn’t respond to a request for a comment. The strike authorization vote comes at the end of a record year for hospitality strikes. At least 20 work stoppages have occurred over the course of 2018, the highest number in at least two decades. Hospitality workers in Los Angeles are asking for a $25 minimum wage. Other UNITE HERE labor contracts across the country guarantee more than that. 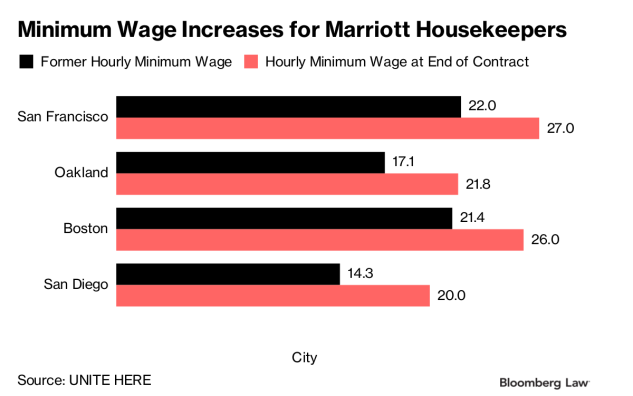 San Francisco Marriott housekeepers will see their minimum wage jump by approximately $5 by the end of their contract’s terms. Housekeepers previously made approximately $22 an hour and will make $27 by the end of the new contract, UNITE HERE spokeswoman Rachel Gumpert told Bloomberg Law. Housekeepers in Boston will also make more than $25 by the end of their contract. They previously earned $21.45, and will see pay jump to “close to $26" by the conclusion of the contract, UNITE HERE’s Boston Local President Brian Lang told Bloomberg Law.